added for Color Retention and Polysorbate 80. From Bonnie of Yulee, Florida on 4/5/2019 . From Anonymous of St.Simons Island, Georgia on 3/31/2019 . I was a little disappointed. Taste too much cinnamon. I was looking for the really old-fashioned sweet mix pickle. From Sheryl Pope of Florence, South Carolina on 2/13/2019 . I've always loved Sweet Mixed Pickles but you have taken them to a new level with the Candied Sweet Mixed. . Unfortunately shipping makes these a little more expensive and I won't be ordering as many as I would like. Will still order but not as many. Thanks for these wonderful pickles!! Maybe consider paying for shipping?? From Angale Price of Belews Creek, North Carolina on 1/13/2019 . These are absolutely delicious, they taste like the icicle pickles my grandmother use to make when I was a kid. I had the first jar way in 2 days they were so good. I am most definitely ordering more. Delivery is very fast and packaging is perfect. From Anonymous of Mission, Texas on 12/30/2018 . I visit Indiana once a year, because I grew up there. Always get these pickles while there but soon run out so have to order on line. They always arrive very fast and packed well. 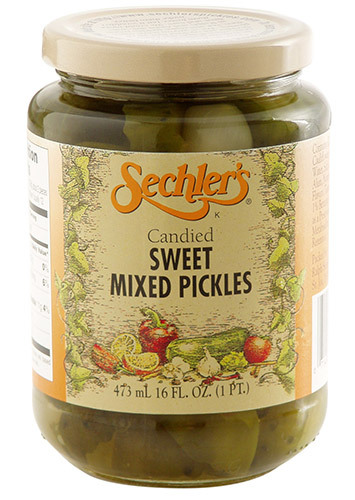 I tell everyone I am hooked on these Candied Sweet Mixed Pickles. They are so good.